If you have wanted to take advantage of North Carolina’s best lake for largemouth bass, catfish and crappie, you can’t go wrong spending a day fishing on Falls Lake. There are always plenty of fishing tips for landing a great haul for dinner and stocking the freezer. The best tip of all is taking advantage of fishing boat rentals. While you can enjoy bank fishing, getting out on the water has several benefits. 1. Check out multiple spots. If you are bank fishing and aren’t getting any nibbles, it can take you several minutes or longer to pack up and relocate to another spot. Fishing boat rentals give you the flexibility to seek out a new spot whenever you want by just bringing in your line and motoring somewhere else. 2. Chance to explore. Many believe that sitting on a bank in one or two spots can get boring. If you are out on the water thanks to fishing boat rentals, you can take a respite from the fishing and explore the lake to enjoy the scenery and see areas you’d never get to see on foot. 3. Bigger fish. It isn’t uncommon to find bigger game fish in deeper waters, and that takes getting away from the shoreline. You’ll also find more types of fish because many do not hang out on the shore. 4. Other activities. Being out on Falls Lake gives you plenty of other things to do when you want a break from fishing. Some anglers enjoy getting in the water with a snorkel to see what is going on down below before they decide on a spot for fishing. Here’s one more tip about fishing boat rentals – get yours from Motor-Boatin LLC. 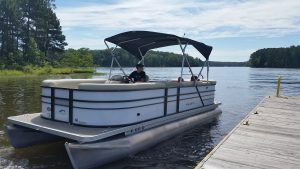 We offer a wide variety of boats for all your lake activities with an easy online 24-hour portal for reserving your boat for use on Falls Lake or to be towed to any lake in the surrounding area. Feel free to call us if you have any questions. 1. Water – While you will have plenty of water all around, you wouldn’t want to drink it. Expect to get thirstier than usual when out in the sun and fresh air. There’s nothing wrong with taking your other favorite beverages, but be sure to include lots of water, too. 2. Sunscreen – Depending on the type of boat you’ll have, shade could be at a premium. If you don’t like the chemicals in traditional sunscreen, don’t go without, as there are natural options available. Apply before you head out and reapply as needed. 3. Snacks – You will also build up an appetite out on the water, so be sure to take snacks or even prepared meals, such as a loaf of bread and sandwich fixings. Fruit, chips, cookies, and other snacks are always appreciated during any family activities. 4. Sunglasses – The glare on the water is dangerous for your eyes. Be sure you have UV-blocking sunglasses. A great tip here is to get a low-cost pair for on the lake because it doesn’t take much for them to end up sleeping with the fishes. 5. Trash Bag – The lake is not a trash can! Take a trash bag with you for empty cans and other waste. You can also use your cooler so you can take empties back home with you. 6. First Aid Kit – It might seem like there aren’t many dangers out on the water, but things can happen. Better to be prepared than cut your day of family activities short because someone gets a cut and you can’t find any bandages. 7. Disposable Products – Consider paper plates for snacking, paper towels for cleaning up messes, and toilet paper. Remember, use the trash bag, not the lake, when you’re done. If you have been holding back on experiencing family act ivies on the lake due to lacking a boat, check out what we offer at Motor-Boatin LLC. We offer boat rentals that will help you create life-long memories for you and your family. Our online 24-hour portal makes it easy to reserve a boat for use on Falls Lake or can be towed to any lake in the surrounding area. Feel free to call us with any questions you may have. Spending a day out on the water with friends and family is supposed to be fun and create life-long memories. If you don’t want those memories to be unpleasant, it is important to know a few safety measures before heading out, particularly if this is your first time. Here is some practical advice for how to stay safe on boats. 1. Pay attention to the weather. Some activities can still be done on a rainy day. In fact, anglers often agree that some fishing is best done when there is a bit of a rain in the forecast. However, a severe storm with high winds or dangerous lightning is no time to be out on the water. 2. Tell others where you are going. A plane must file a flight plan to let those on the ground know where they are going and the path they will take, so that if rescue services are needed, they’ll know where to go. The same is true for boats, only it is called a float plan. In this case, it involves letting someone know where you plan to go, how long you’ll be out, information about the boat, and complete information about all passengers. It is also important to let them know what type of communication and signal equipment is present on the boat. 3. Have enough lifejackets and know how to use them. Everyone hates lifejackets, but you’ll be glad you have one on if your boat sinks or you get knocked overboard and knocked unconscious. 4. Be properly trained in boating. Taking a boating course and learning to swim are two smart things to do before you head out on the water. If you aren’t familiar with the boat, consider bringing someone with you who is. Even if you are knowledgeable about the boat’s handling and operations, having a second experienced boater on board is never a bad idea. 5. Don’t drink and drive. Alcohol use on boats is every bit as dangerous as driving a car when you’ve been drinking. In fact, it can be worse because the fresh air and sun can exacerbate the effects of alcohol. Here at Motor-Boatin LLC, we offer rentals of several types of boats, including pontoon boats, fishing boats, and motorboats. We are happy to answer your questions about boat safety, so you can enjoy a great day out on Falls Lake or one of the other lakes in the area. Our online booking makes it easy to reserve boats, and you can call us with any questions you may have. Getting ready to head out on the lake? What better way to get into the mood than to watch some of the best boat movies ever?! There are plenty of movies that feature boats in one way or another, so you have a long list to choose from. Here are a few of our favorites. 1. Waterworld (1995) – Crazy as the concept of a water-filled post-apocalyptic world sounds, people still manage to enjoy this film. It is set in a world where the melting of the polar ice caps has left everyone to live on boats and artificial islands. How to adapt? How about growing gills and living in the ocean like Mariner, played by Kevin Costner, did? 2. Titanic (1997) – Most of the time, you avoid a movie when someone has already told you how it ends. Considering we all know the tragic fate of those on board the White Star liner, this film is captivating as we fall in love with Jack Dawson (Leonardo DiCaprio) and Rose DeWitte Bukater (Kate Winslet) as we hoped they’d get a happy ending despite the sinking Titanic. 3. All is Lost (2013) – The reason this one makes the list isn’t because Robert Redford makes a great hero, but because of the lessons that can be learned from his mistakes. His solo voyage runs into trouble (mistake #1 is going solo!) when he collides with a stray shipping container (mistake #2 is not being aware of your surroundings). See if you can spot more things that you would have done differently in this unique survival drama that could help you should you experience a problem one day. 4. Jaws (1975) – Granted, this one has the potential to make you swear off boats and the water instead, but that cheesy fake shark is downright funny if you think about it. If you really can’t get enough, check out Jaws 2, Jaws 3-D, and Jaws: The Revenge, although we’re pretty sure you’ll find the first one the best of them. 5. Pirates of the Caribbean (Any of them!) – Add together boats (pirate ships to be specific), swashbucklers, and adventure, and you’ll be going through plenty of popcorn if you watch all five currently available. Now that you’ve had your fill of movies with boats and you are ready to get out on Falls Lake or one of the other lakes in the area, turn to us at Motor-Boatin LLC for boat rentals. Our online portal makes it easy to reserve motorboats, bass boats, fishing boats, pontoon boats, and even jet skis for a day of adventure with your family or a chance to catch the biggest fish ever seen. None of our boats attract sharks – we promise! The winter blues are finally abating. It is time to get one with nature again. Spring seasons in NC are just breathtaking. The rebirth of all the dried greenery can be quite a sight. Boating through Falls Lake is just the right way to experience the rebirth of nature. As the flowers bloom and trees start to provide the shade, area residents use this opportunity to recharge. Renting a spacious campsite along the lake is just what we need to take a break from the increasingly busy life. There are plenty of activities to enjoy, even if the water is still a bit cool. Go Camping: First and foremost, pack a bags, grab some food and camp out right next to the water. Enjoy the weather and plan hikes! There are more than 300 campsites along the access areas of the Falls Lake recreational areas. Go Fishing: Call Motor Boatin’ to reserve a spacious yet sleek fishing boat to enjoy a peaceful afternoon on the water. The fish are always biting and the fishing veterans are ready to share their stories. Grill a Nice Meal: It’s never too early to bring the hot dogs and burgers to enjoy a filling and delicious meal while surrounded by nature. Grills and pits are available at Falls Lake, so don’t bother to bring your own. Boating on the Water: You can also rent a pontoon boat or a jet ski. We have plenty of styles and sizes to suit each individual or group need, so feel free to inquire about what’s available. North Carolina enjoys all four seasons, and it is especially lovely at springtime. Our lakes have the perfect weather for outdoor fun. Contact us at Motor Boatin’ to get more ideas to plan your weekend at Falls Lake!